Bruce Wayne chose the bat as his symbol because it frightened him, and he wanted criminals to share his fears. 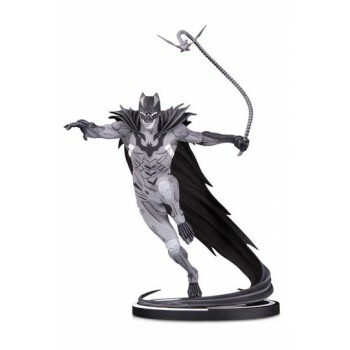 Fear can translate as intimidation, or in the case of this Batman Black & White statue by artist Kenneth Rocafort, it can become nightmarish fright. This statue incorporates demonic and otherworldly elements, including a serrated cape, skeletal feet and a vampiric bat symbol, and will stand out on any shelf or collection. Limited to 5,000 pieces. Individually numbered. Statue measures 22 cm tall. Designed by Kenneth Rocafort; Sculpted by Paul Harding.